Contoured back maximizes support and comfort. Two-strap system with buckle closure secures back support to an existing back surface. Straps can be stored in back pocket when not in use. Removable lateral supports are individually height and width adjustable. 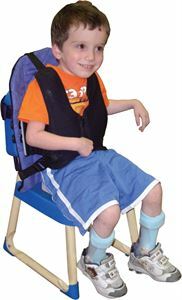 Zippered vinyl trunk harness in an H configuration for anterior chest support. Distance between laterals: 5" - 8"
Seat to Laterals: 4" - 7"